Give clients something special this year with high-quality gifts made in North America. Our clients are some of the most innovative and creative people around, all of them have impeccable taste. So when it comes to the holiday time, we like to show our love and appreciation with a one of a kind gift. So what makes a gift truly memorable? We think it is a combination of totally unique ideas, premium materials, and most importantly, personalization. Now, these so happen to be some of the major strengths of rapid fabrication technologies like laser engraving and 3D printing. Before these processes arrived on the scene, creating a custom product required getting massive quantities of items manufactured and shipped from abroad, today you can create custom branded items and get them personalized right here in your neighbourhood. We love it because unlike previous manufacturing procedures, laser cutting is flexible when it comes to what materials can go through the same machine. As a result, we have engraved on almost any surface you can think of including wood, textiles, metal, fine leather and even wild and wonderful materials like gingerbread! This means that the options for high-quality and novel gifts are as broad as your imagination. Sign up for a FREE Gift Guide! Now, get the creative spark with our top 3 corporate gift ideas! If you want to get everyone on your team something unique this year then personalization is the way to go! Everyone loves the feeling of receiving an item that was made just for them, and custom engraving lets you do just that. 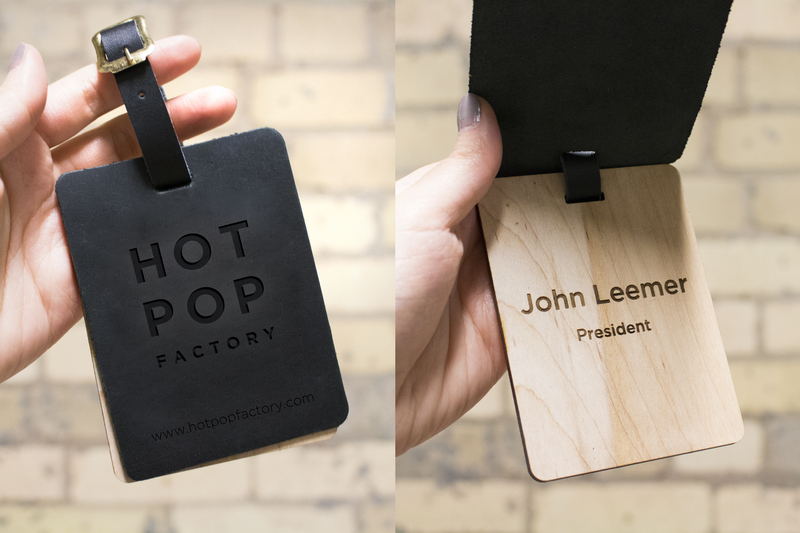 One beautiful option for travelling sales teams or high-flying clients is custom leather and wood luggage tags. For this project we used locally sourced urban wood from Toronto, Canada. This sustainability initiative from the City of Toronto uses trees that have fallen from natural causes and salvages the material for designers and artists in the area. Then, for the leather we worked with local leather workers who dyed and prepared the material for laser cutting. Finally, we laser engraved the name and logo for a finished and clean-cut look. Companies have also been creative and gotten us to print a variety of colours on the leather and wood. As November hits us, everyone is getting into the holiday season rush. Here are some beautiful gifts that don’t look last minute. We have customized everything from concrete coasters to handmade wallets, and the best part is that the laser engraving can be done lightning fast! Recently, we completed sleek cardholders for LGA Architectural Partners, artistic coasters for Grolsch and striking cutting boards for Eat Industries. Each product had it’s own story. 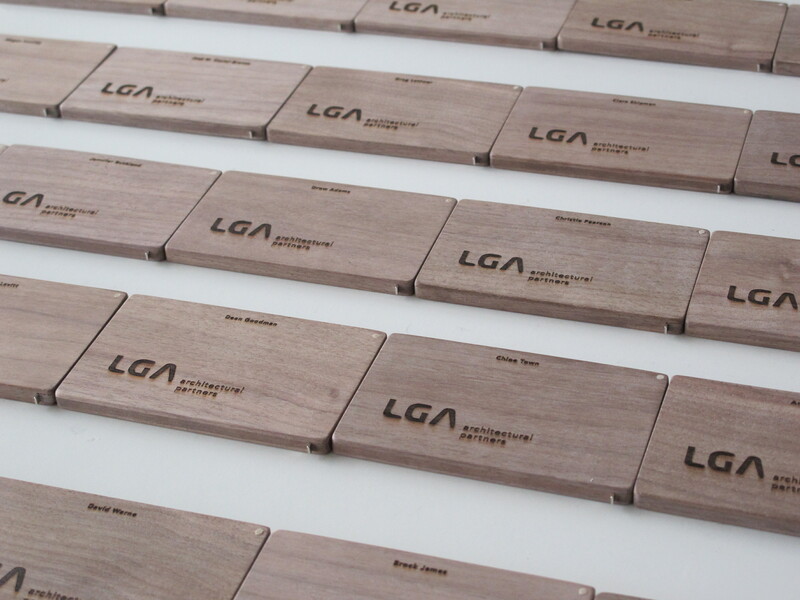 When LGA Architectural Partners approached us, they wanted to get staff excited about their new brand image. So we sourced a hand made wooden product that evoked the same design and sustainability values as the company. We then worked with their graphic designer to incorporate personalization and to laser engrave the new logo onto the product. The final result was modern, memorable and held a personal touch each team member. The one thing our clients love most about laser cutting is that you can personalize a gift not just in terms of the message that is engraved, but also what material the engraving is done upon, and what could be better for a local meat and produce shop than engraving on the very cutting boards they will be using every day. 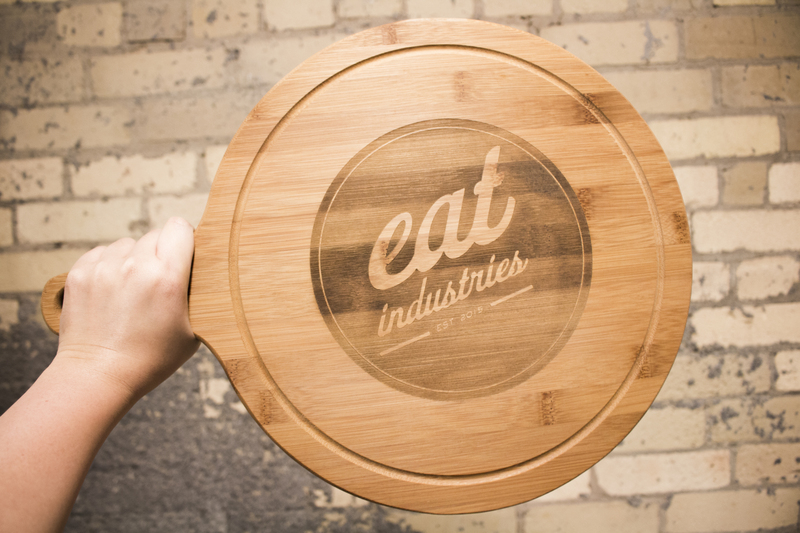 This recently happened when we helped a retail customer personalize a set of cutting boards as a present for the owner of Eat Industries. It was a great way to celebrate the opening of a new business and create a piece of beautiful and long-lasting marketing material. The only thing better than a gift is a holiday party, so start yours off with a bang! 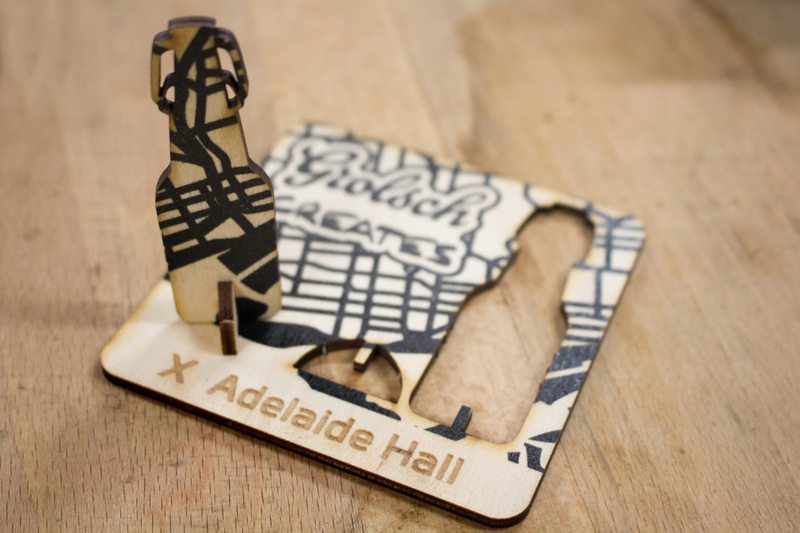 When we started working for Grolsch Breweries they were looking for really unique event swag. 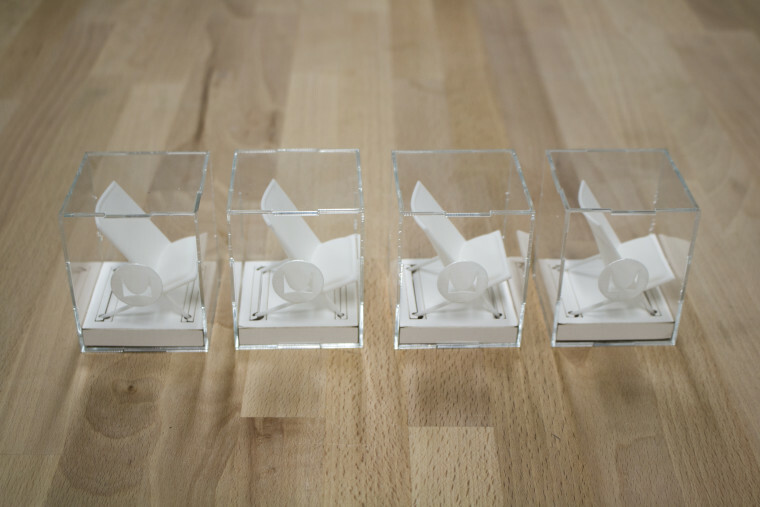 The client’s goal was to create the surprise and delight that we all remember from opening childhood trinkets. Together with their event planner we worked on custom coasters from scratch incorporating a map of Toronto and precision laser cutting. For this project we focused on the signature Grolsch swing-top bottle, and produced a miniature pop out toy that would be collectable from various venues. One of the most unique projects we have done is for Herman Miller, a furniture company with a focus on modern design. Herman Miller wanted to create a gift made especially for their design clients, so only an innovative and unique idea would do. For this project we produced and packaged miniature versions of their Scissor Chair, which were originally designed by the legendary designer Ward Bennett. 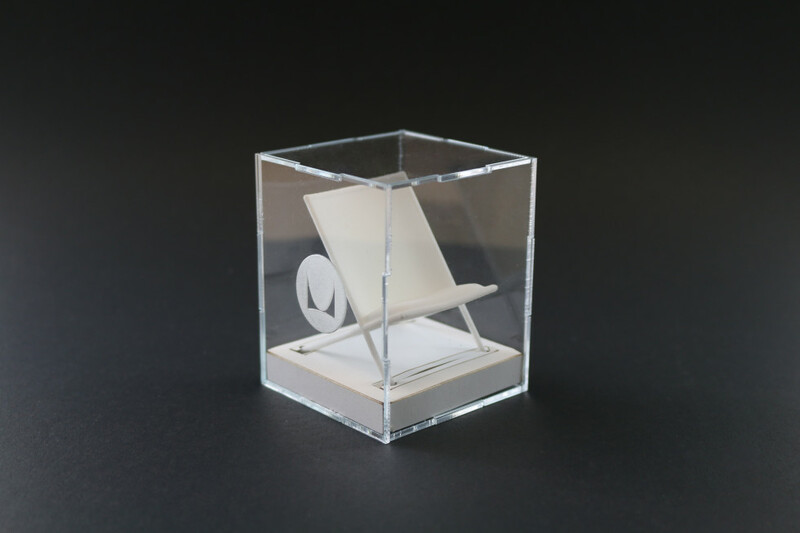 To execute this project each individual chair was 3D printed and then packaged in a clear plastic container that had been laser cut and laser engraved. Measuring only 2 inches tall, these little gems were really tough to give away! Looking for more ideas? Sign up for a FREE Gift Guide!